Nothing worthwhile ever comes easy, a person has to grind his energies, ram his abilities, and put forward his talent and skill to confront the challenges of life. Whether it is to deal with noisy clients on the workplace, or to manage the tasks on the desk, everything requires patience, tolerance against the negativity and firm believe in oneself. If a person gets tired of his routine the survival will become difficult for him. It is only about managing the things, doing them with heart and leaving no space for the mistakes. It is a level of maturity that is attained after years and years of work. Even though a person is unruly, elsewhere he has to act professional in his workplace. When we talk about designers, they are the liveliest homo-Saipan one can ever know, because they don’t live in the boredom and try to bring the happy gestures out of their busy routine. They behave in the most natural and sensible ways of working on professional front hence if I say designers show grace under pressure it won’t be wrong. Working with big companies and organizations require professionalism. There you cannot do hank-panky, maybe once or twice but it is not going to work every time. It will only put a bad mark and impression of yourself onto others. 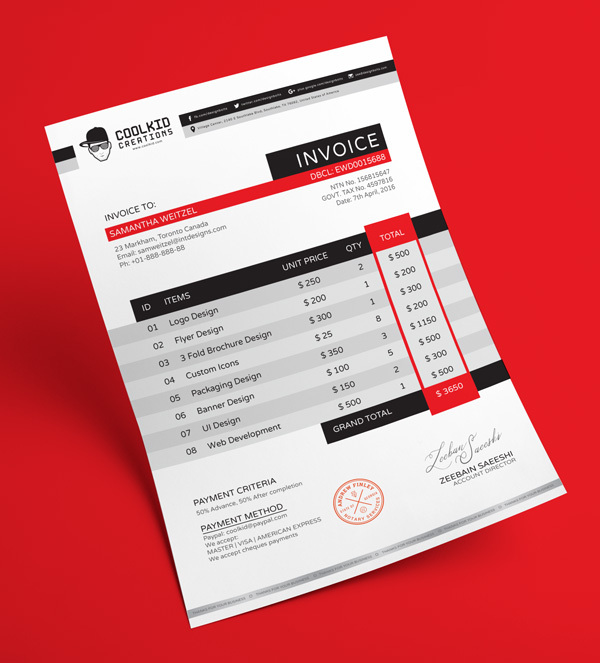 Today I am unfolding free professional business invoice template design that I designed for all the graphic designers who have their clients all across the globe. You can take benefit of this invoice to send away the entire charges/rates, of what you are supposed to deliver to them. It is hassle free, and you time will be saved, just insert in your own quotations and send it right away into the mailbox of your clients. Oh this cyber world is amazing, everything can be bought and given away just on a click. I am sure it is going to pay you a great deal. Try this out and let me know how does it work with you? For more freebies, stay hooked to us.